Whether you’re searching for ways to pay down debt faster, claim lucrative travel rewards, or earn cash back, Bank of America has the solution, with a suite of high-quality credit cards that customers consistently rate favorably. If you're seeking cash-back versatility to earn premium cash rewards on a category of your choice like gas, dining, or travel, this offer is perfect for you. The best-in-class introductory bonus offer, premium travel & dining rewards, and up to $200 in travel-related statement credits make this a compelling offer for travelers who can justify paying an annual fee. If you’ve spent time in the United States, you’ve heard of Bank of America. They may be the second biggest bank in the country, but Bank of America has never been high on the list of banks when it comes to rewards credit cards. However, between partnerships with major travel brands and the recent release of a premium rewards credit card, it’s clear that Bank of America is stepping it up. 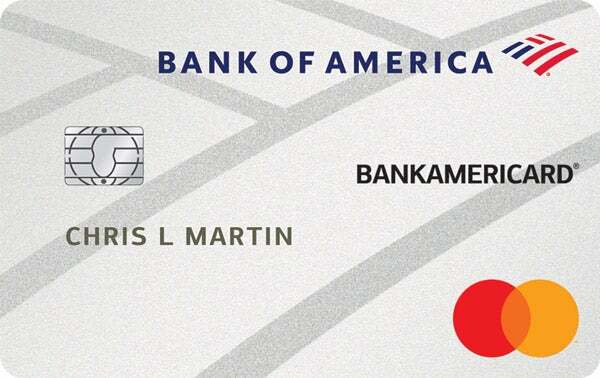 Simple and effective, these Bank of America credit cards offer a great boost for your wallet. What are Bank of America points worth? In order to make our “best of” lists, credit cards need to offer valuable perks and rewards, or they need to come with benefits that can help you out financially. We also like our credit card favorites to be low cost, but we understand that premium rewards are sometimes worth high fees. Here are some of the main factors we considered while comparing different Bank of America credit cards. We love a great sign-up bonus, and we look for bonuses that are easy to achieve and redeem. More importantly, we look at the ongoing rewards rate, because you want your card to be valuable in the long run. Premium perks like annual bonuses and lounge access are also considered. Annual fees and the ongoing APR are weighed against the benefits of the credit card to make sure you’re always making money, not losing it. The best introductory offers on credit cards have long promotional periods, a low APR, and minimal fees. The launch of The Ascent has us scrutinizing thousands of data points and hundreds of credit cards to develop the best credit card ranking system out there. But we’ve been doing this for a long time -- collectively, we’ve written more than 2,300 articles all about taking advantage of the top credit cards offers, making your money work for you, and crushing your financial goals. This advice isn’t just second-hand, either. We’re all credit card enthusiasts here and we’ve used offers like these to rack up miles and points, save money with cash back, and get out of financial ruts without paying a penny in interest. Bank of America offers all of the typical credit card types: travel rewards credit cards, cash back credit cards, and non-rewards credit cards. Travel rewards credit cards can be broken down into generic rewards and co-branded rewards. See the descriptions below to understand the difference. The best travel rewards credit cards offer points or miles that can be redeemed for different travel experiences. These types of rewards are less flexible than cash back, and often, users end up with rewards they can’t even use. However, if you choose a travel rewards credit card that’s right for you, you could end up with huge bonuses and great perks, especially if you like to travel. Bank of America’s generic travel rewards credit cards, like the aptly-named Bank of America® Travel Rewards credit card, offer points through their Bank of America rewards program. These points can be applied to travel purchases. They’re more flexible than co-branded rewards, but they might not offer the highest value for some. 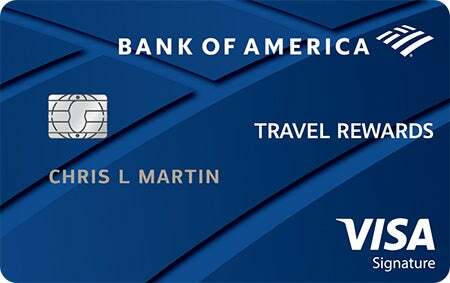 Co-branded travel rewards credit cards are offered by Bank of America in partnership with another, typically travel-related, company. Bank of America offers credit cards that are co-branded with airlines like Virgin Atlantic, Alaska Airlines, Spirit Airlines, and Allegiant, as well as other travel partners like Amtrak, Norwegian Cruise Line, and Royal Caribbean. While the points you earn can usually only be redeemed with that specific travel partner, these cards often come with huge sign-up bonuses and generous rewards on spending with that partner, as well as perks like free checked bags and other discounts. Cash back credit cards offer the most flexible and simple rewards. For each purchase you make, you’ll get a percentage of it back in the form of “cash back.” The amount you get back might be a flat rate for all purchases, such as 1.5%, or it might change depending on the category of your purchase, such as cards that offer 5% cash back at grocery stores or 3% cash back on travel purchases. At a flat rate of 1.5% cash back, you’ll get $15 back for every $1,000 you spend. Of course, not all Bank of America credit cards offer rewards. Those that don’t sometimes offer other useful benefits, aside from access to credit. These benefits can include a low interest rate, a 0% introductory APR on new purchases or balance transfers, and advantages like purchase protection and credit score tracking. Each credit card issuer has its own quirks when it comes to credit card approvals, and Bank of America is no different. Credit score requirements will vary depending on the card, but you typically want to have good credit, which is defined as a FICO® Score of at least 670 or above. In addition, Bank of America has an application rule dubbed the 2/3/4 rule. You cannot be approved for more than two Bank of America credit cards in any two-month time span, three in a 12-month time span, and four in a 24-month time span. There is also some evidence that Bank of America tends to preference applications from people who have formed a previous relationship with them, such as through a checking account, savings account, investment account, or personal loan. Some of their credit card rewards programs also give bonuses to cardholders with certain Bank of America accounts. Be aware though some Bank of America account holders have reported still receiving denials because they didn’t have enough money parked in their account. Generally speaking, Bank of America’s rewards program offers points that have a flat-rate value of $0.01. Some options do offer a lower redemption value, but they aren’t a good choice to use for that reason. Bank of America’s rewards program offers points that can be applied to a range of redemptions, from travel to cash back to gift cards. The details of the program differ depending on which credit card you hold. The Bank of America rewards program is simple and offers a decent redemption value that all cardholders can take advantage of. Options like travel credit redemptions allow you to apply your points at $0.01 each to any travel purchase from any qualifying company, giving you extra flexibility. For Bank of America credit cards that earn travel points instead of cash back, this is easily the best redemption option. If you qualify for the Preferred Rewards program with Bank of America, you’ll get much larger earnings bonuses -- 25% to 75% on all point earnings. However, you do have to be a pretty loyal Bank of America customer in order to qualify. The lowest tier, which offers a 25% point bonus, requires you to hold at least $20,000 across any Bank of America accounts. The next tier, which offers a 50% point bonus, requires a minimum balance of $50,000, and the highest tier, offering a 75% point bonus, requires a minimum balance of $100,000. What counts as a travel purchase? With Bank of America’s travel rewards program, you can use your points to get $0.01 back per $1 spent on travel -- but what counts as travel? Luckily, this category is pretty open-ended. It can include flights, train tickets, hotel stays, taxi cabs, museum entrance fees, amusement parks, and rental cars. It also includes vacation rental websites such as VRBO, Airbnb, and HomeAway. This allows you to use your rewards for travel purchases you typically wouldn’t be able to pay for with points. Are Bank of America points transferable? The points you earn with Bank of America are not transferable, unlike some other programs. This means that you can’t transfer your rewards to another airline or hotel chain. They must be redeemed through the Bank of America system. This is a major weak point. What are the minimum redemption requirements? Redemptions do begin at 2,500 points, which means that if you have anything less than that in your rewards account, you won’t be able to redeem your points until you reach that threshold. Each Bank of America credit card offers distinct benefits and perks, so it’s important to compare the differences between the various offers before making a decision. The tables below will help you understand exactly how our picks for the best Bank of America credit cards differ. Which Bank of America credit card is right for you? To choose the best Bank of America credit card for your needs, you’ll really want to analyze your financial goals and spending habits. Are you paying off debt? The BankAmericard® credit card is clearly the best option with its long 0% APR offer. 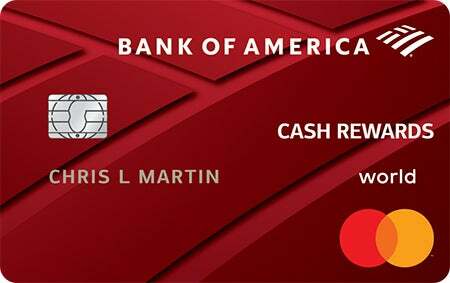 The Bank of America® Cash Rewards credit card is a secondary offer to consider with a shorter 0% APR, but includes a cash rewards program. The Bank of America® Premium Rewards® credit card and the Bank of America® Travel Rewards credit card really depends on how much you spend on travel each year. 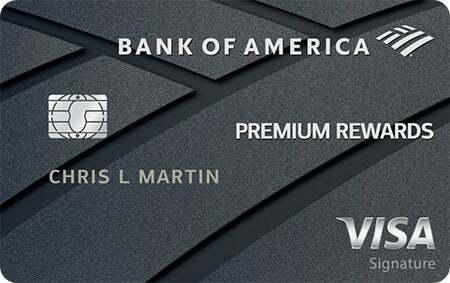 The bigger sign-up bonus and the airline incidental and TSA Pre✓® or Global Entry statement credit offered by the Bank of America® Premium Rewards® credit card mean that it easily offers the best value for just about anyone in the first year, despite its $95 annual fee. However, after that first year, it gets harder to decide whether or not the $95 annual fee on the Bank of America® Premium Rewards® credit card is worth it. The biggest added value over a rewards credit card with no annual fee is the $100 statement credit for airline incidentals. So, in order for this card to be worth it in the long run, you’ll need to spend at least $100 per year on things like checked bags, airport lounges, ticketing fees, and in-flight services. Overall, the most important thing to consider when choosing a credit card is whether or not you’re going to use it enough to get a good value out of it. It’s also important to remember that no matter how much value you get from a credit card, it’s never worth carrying a balance and paying high interest fees, so don’t use them as an excuse to spend beyond your means. The main way to earn rewards with Bank of America is through your regular spending on one of the rewards credit cards listed above. However, there are a few more things you can do to give your point balance a boost. Take advantage of the promotional APR -- If you have a big purchase coming up or some debt you need to pay off, a credit card with a 0% introductory APR can go a long way in helping you save money on interest. Just make sure you can pay off the balance in full before the promotional period ends. Get the sign-up bonus -- If the card you apply for has a sign-up bonus, make sure you can meet the minimum spending requirement. These welcome gifts can give a huge boost to the value of the credit card. Maintain a big balance in your account -- Additionally, Bank of America offers a Preferred Rewards program that gives you a 25% to 75% bonus on all your rewards earnings as long as you maintain a certain minimum balance across any Bank of America account. You need an average balance of at least $20,000 to qualify, and for the highest Preferred Rewards rate, you’ll need to keep a balance of at least $100,000. Book travel through the Travel Center -- Purchases made through the Bank of America Travel Center will earn a bonus of 1.5 extra points per $1 spent. For example, with the Bank of America® Premium Rewards® credit card, you’d normally earn 1,500 points on a $1,000 travel purchase. However, if it’s booked through the Travel Center, you’ll earn 3,000 points.